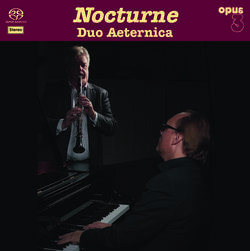 Duo Aeternica consists of clarinet player Kjell Fageus and Love Derwinger, Sweden's best grand-piano player. The album contains a nice selection of romantic classical music from various composers including Franck, Faure, Nadia Boulanger, Lili Boulanger, Talleferre and Rota. Kjell Fageus, former principal clarinet at the Royal Opera Orchestra in Stockholm, is a versatile musician performing chamber music with Sweden's leading musicians and also appearing as a soloist. Love Derwinger has made over forty recordings on the labels BIS, CPO, Arte Verum and others, including his critically acclaimed performances of the original version of the Grieg Piano Concerto, Max Regers Piano Concerto and Wilhelm Stenhammar's first Piano Concerto. The music on this album "Nocturne" was recorded in a church with outstanding acoustics! The program on this record is put together with the ambition to present beautiful music from 19th and 20th century that also will widen the repertoire for clarinet and piano. The main parts of the music are transcriptions carefully adapted to be played on the clarinet. All piano parts are original. 18 songs. This Stereo/Hybrid SACD can be played on any standard compact disc player.